Dispensing the great Nescafe flavour. At CDK Coffee Solutions we think getting your caffeine fix doesn’t have to be hard work! If you need to provide hot beverages for your team; large or small, just give us a call on 027412 12 12. Our beverage equipment dispenses Nescafé®, New Zealanders most preferred coffee, at the touch of a button in a range of popular drink options; black & white coffee, cappuccino, latte, moccaccino and hot chocolate. We have been customers of CDK Coffee Solutions for many years. Orders for supplies are delivered quickly and efficiently. 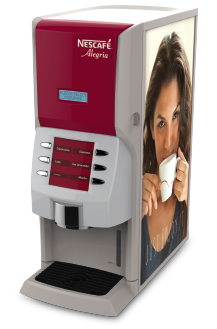 Our Coffee Machine is very reliable with 18 staff using it numerous times a day. If a problem does happen to occur the servicemen are here without delay. We cannot speak highly enough of Charmaine and her Team’s service. They are a great company to deal with. 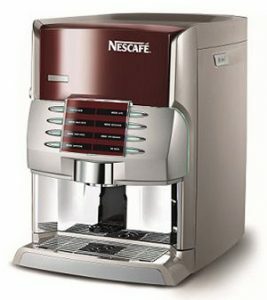 Nescafé® hot coffee machines are suitable for any workplace where hot drinks are needed; current customers include factories, offices, retail stores.